Looking for a Desktop Support Engineer Job? Want to quit your present job and opt to be as a reputed Desktop Support Engineer? If your answer is ‘YES‘, then you need to prepare well for the interview; as a Desktop Support Engineer, you will be mainly responsible for managing a multi-user computing environment of a company with the help of LAN [Local Area Network]. When working in a company, you always need to be alert with all desktop support engineer roles and responsibilities. 1. Perfect installation of the Windows OS (operating system). 2. Maintenance of all the Installed Windows OS. 3. Updating and Installing New Software. 4. Establish a connection between Remote Desktops. 5. Protect the OS from viruses by regular scanning of the OS by Anti-Virus software. 6. Handling all the Back-up and Recovery Process of the company. These are the important roles and responsibilities of Desktop Support Engineer which should be handled properly if selected for the post. While preparing for the interview, you should be well versed of all the latest technologies and functions of the post of Desktop Support Engineer. You should very well understand the role of desktop support engineer. Installing Windows OS on Desktops. Managing the shared folders and troubleshooting if any problem occurs. Troubleshooting the Hardware Devices and setting them to a suitable configuration. Resolving all startup and login problems that occur. Resolving the LAN connection problems. Handling the Outlook Express work. Solving the issues related to Applications and updating them. Handling all the issues related to the Security Permission of the websites. Basic Fundamentals of OSI, IP and TCP models. So, this was all about the Basics and Fundamentals that you need to work on before going in for the interview of a Desktop Support Engineer. Now let us see what exactly happens inside the box. 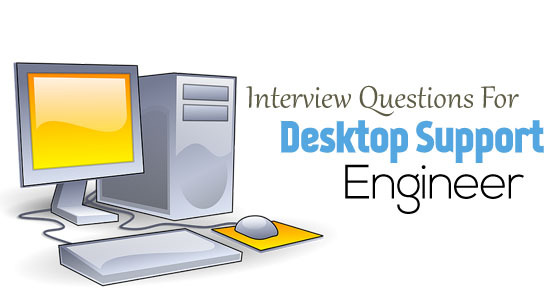 What questions generally does the HR, Recruiter or the Interviewer asks for the post of Desktop Support Engineer. The following mentioned are few desktop support interview questions along with its answers. 1. Which is the most comfortable Windows OS for you to work on? It is one of the most common questions that can be asked to you in the interview. For this, you just need to do a bit study on the Different OS and select the one with which you are most comfortable. Also, it will be very useful if you do specific pre-study on the OS that the company is using and then you can easily elaborate on it and easily showcase your skills. 2. What is the use of DHCP? You can start with- The term DHCP stands for Dynamic Host Configuration Protocol. The use of DHCP is, it helps us to define a specific dynamic IP address to all the network devices, which further allows the devices to get a new IP address when every time it is connected. 3. What is the basic use of DNS at workstations? The DNS (Domain Name System) is basically used to set host names that are readable by humans easily. For example: www.globewarm.com is the DNS IP address and it’s machine IP address is 69.143.204.22. Generally, the DNS is pre-configured on the working stations and the OS automatically rectify the domain IP address and resolves it into machine IP address to work on. 4. What do you understand by a Default Gateway? What will happen if we don’t have one? A Default Gateway is mainly a routing device that is used for sending all the unaddressed traffic to the destinations in the local area sub-net and we do not have a default gateway then it will be impossible to have a perfect connection/communication with the host of different networks. If you are using a Dial-Up connection then it is not at all necessary to have a default gateway because it already has one installed in the ISP. 5. How can we track the path of the packet going to its destination? For finding or tracing the path of a packet going to its destination you can take the help of the ‘tracer’ command to resolve this problem. 6. What is the significance of the Safe Mode and when to apply it on a working OS? The Windows Safe Mode option is basically used for diagnosing the OS and removing the spyware in the OS, also it lets you troubleshoot the drivers and configure the software. For the proper running of all the programs in the OS, only some of the files and Specific limited programs are needed to support the OS. With the safe mode option, you can remove the unwanted scrap from your OS and also it lets you to perform a diagnostic test on the OS which is not actually possible in the Windows Normal Mode. 7. What are the ways to start the OS in safe mode? (i). When you are using the OS close all the programs and restart the system, as you observe that the OS has started then press the F8 function key multiple times so that it brings up the window having multiple booting options and also it will have the option to start the computer in safe mode. (ii). Press the Windows key at the down left corner of the key board along with R letter; this will open up the RUN window. Type in there-> msconfig, the system configuration window will open in front of you and there you can select the ‘minimal’ option in the safe boot option, this will help you to start the computer in Safe Mode from next time. 8. Give the main significance of the Boot.ini file? The Boot.ini file is used for the boot process of the OS, it stars with Windows NT. This command also helps in work of dual Booting of multiple OS in the same computer. 9. How to edit the boot.ini? Open the Run window as mentioned above and again type the MSCONFIG command and open the configuration dialogue box. 10. How can we check the IP configuration? Easily you can enter the “ipconfig” command in the RUN windows it will open all the configurations of the IP and TCP. 11. How can we convert the Hard Disk into Dynamic? Log in the administration account. Open the RUN windows and type in the “diskmgmt.msc” command; you will get a new window from there, select the option by right clicking to Basic hard disk to Dynamic hard disk. 12. “Blue Screen of Death” what do you understand by this term? The main reason of this error is because of the incompatibility of some of the software or the hardware of the OS. Installation of unwanted and faulty software. Take out the RAM and clean it by rubbing a rubber on the chip side and again insert it back. If the error occurs again then try using the RAM on another computer. Every error of BDS has a unique code with it, you can copy it and search for the solution on GOOGLE. 13. What are the main sources of the viruses to enter in an OS and how can we prevent our OS from it? These are the main sources from where a virus can infect your OS. We can prevent our OS by installing a licensed and original Anti-virus which works well on the respected OS. 14. Describe the common types of LAN cables used nowadays? What is the ideal length that can be used for the proper communication through LAN wires? Cat 5 and Cat 5e UTP cables can support data speed up to 100 Mbps. Cat 6 and Cat 6e UTP cables can support data speed up to 1 GBps. The length of the LAN wire works well up to 80 meters or 260 feet. If the length of the wire exceeds then the speed will be definitely affected. 15. What can be the possible reasons for error “Windows cannot currently connect for updates”? Contact the Microsoft by reporting a problem. Type the ‘services.msc’ command in the RUN window. Find the update windows option. Type ENABLE in the Start Up blank. Click on OK at last in the bottom of the window. 16. What do you understand by sysWOW64 folder? This type of file is mainly found in 64-bit OS like the 64 bit Windows 7. It is like the system file similar to the system32 file in 32-bit operating OS. 17. NTLDR error- what do understand from it? NTLDR is the network loader. This function helps in loading the OS. When this file is missing from the OS then this error occurs. It can be resolved by copying the NTLDR file from the OS CD. 18. Elaborate on the different types of OS? What is a VPN server and a RAS? The term VPN stands for Virtual Private Network. The VPN server is a private server which is widely used by companies, organizations and government bodies for communication purpose and also to communicate privately over the Local or the Public server. The RAS stands for Remote Access Server and is basically used to operate nearby Remote Devices. Explain the different types of operating systems ? How to deal with “missing NTLDR file” error? Explain the difference between Alternate DNS and Preferred DNS server. Compare Incremental Backup Vs Differential Backup Vs Copy backup. The last best configuration you have seen. Explain BSOD (Blue Screen of Death) and the ways to overcome it. Explain the terms disk clean up, disk defragmentation, device manager and system restore. Before you go to the interview, do a detailed study of all the topics related to the interview and the post you are applying for. Also ,cover a bit on the latest technologies available or launched in the market. Always thoroughly read the resume and do not copy and paste a single thing form anywhere, so that you will always remember the mentioned strengths and weaknesses in the resume. Also ,there will be no mistakes in the resume and everything will be up to date. Make sure that you attach a copy of all your professional and educational certificates along with the resume as it makes a professional image in front of the interviewer and also it will make it easy for the interviewer to go through your profile and cut short some of the questions during the interview.